The Ultra Traditional Triple Exposed Thermostatic Shower Valve with riser and slide rail kit brings substantial elegance to the modern bathroom. 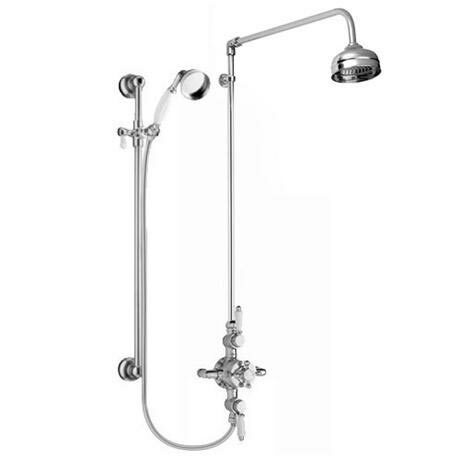 This Exposed Thermostatic Triple Shower Valve offers thermostatic showering via three easy-to-operate controls. The traditional rigid riser kit is comprised of exposed pipework with a 4" Chrome Apron shower rose on an adjustable ball joint. For total flexibility, the shower valve is supplied with a traditional slider rail Kit. Slider rail kits provide a more flexible showering solution for all user large or small. Capture the aura of a bygone time. Suitable for all types of plumbing. Create a stunning traditional aesthetic in your bathroom and complete it with an invigorating shower experience with the Premier traditional shower. It includes a 4" rose shower head and rigid riser handheld shower, giving you a unique wash every time. It offers the perfect balance between beautiful design and incredible build, made with a brass interior for a strong and durable body, and finished in chrome for a shine like no other.